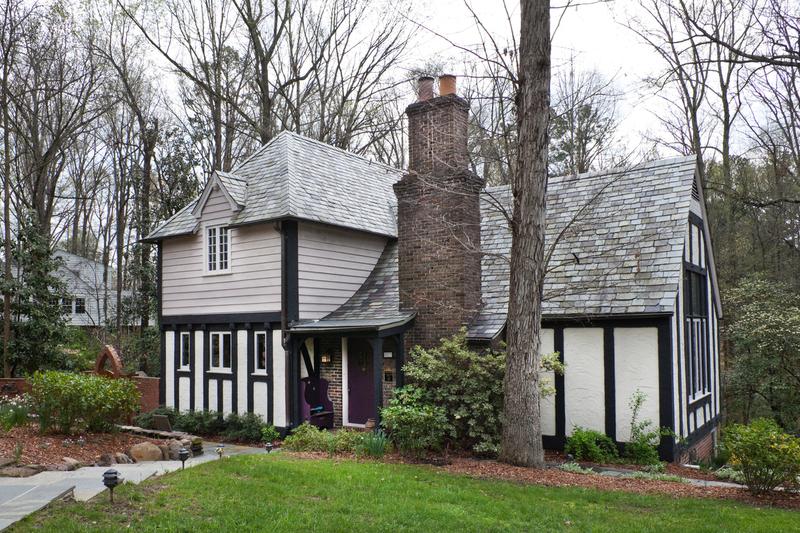 Every spring, Preservation Durham (formerly the Historic Preservation Society of Durham,) presents a home tour in one of Durham's historic neighborhoods. The 2012 tour includes seven homes in a variety of styles and vintages. The tour took place on Saturday April 28, from 10am-3pm. 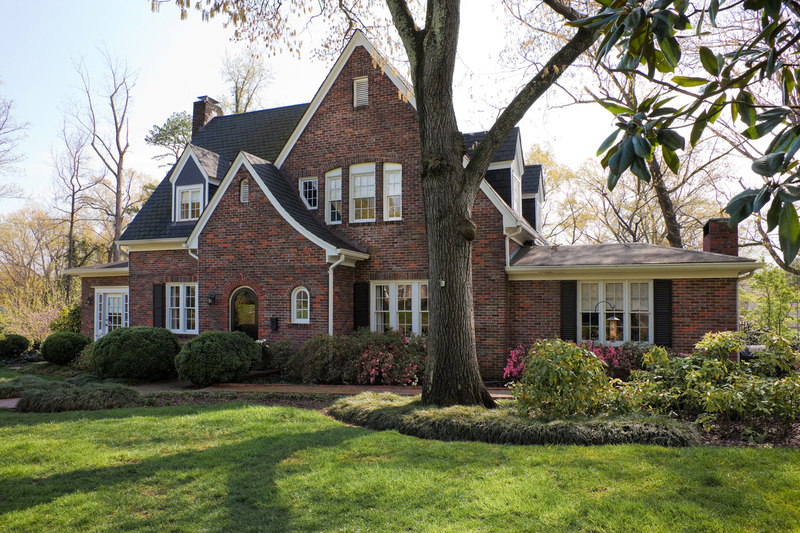 Tourgoers on our 16th annual tour can explore homes in several popular styles, including Colonial and Tudor Revivals from the 1920s and Modernist houses from the 1950s. Seven homes and two gardens are included in this year's tour, all within easy walking distance of each other. Hugh Edward White, an office manager at Liggett & Myers Tobacco Company, and his wife Anne Parker purchased the lots at 1506 Hermitage and constructed the grand, Colonial Revival-style house about 1924. I'm so excited about the Forest Hills tour!! Is there a date yet for a 2013 tour? I, too, would like to know if there will be a tour of homes in Forest Hills, particularly the Dillard and Mildred Teer home. I am interested as I have worked for the Nello L. Teer Co. and when I worked at Central Carolina Bank, Dillard was a tenant in our building and I have always wanted to see the inside of his house. This elegant and beautiful family home has a hidden claim to fame: it was the main set for a 1990 film called ‘Once Around’ with Richard Dreyfuss and Holly Hunter. Ostensibly set in New England, the family’s house throughout the film actually stands here at 1506 Hermitage. Snow (really styrofoam) was brought in to shoot the winter scenes in the middle of summer, and the movie trailer shows people dancing in the foyer and a wedding bouquet thrown from the stair landing. Before Hollywood came to town, this house had served a number of Durham families ably. Hugh Edward White, an office manager at Liggett & Myers Tobacco Company, and his wife Anne Parker purchased the lots at 1506 Hermitage and constructed the grand, Colonial Revival-style house about 1924. In the 1930 census, their three children Hugh E. Jr., Sallie F., and Annie M. are listed, as well as a servant named Annie M. Sharp. In 1933, the Whites sold the house to Claude M. Flowers and his wife Mary Whitaker, who moved with their children from 1005 Monmouth in Trinity Park. The Flowers name has a long history in Durham, as his father Col. George Washington Flowers was a trustee at Trinity College; William Washington Flowers was chairman at Liggett & Myers - buildings on both Duke campus and the L&M factory bear the Flowers name. Claude followed his father, graduating from Trinity in 1909, then into the tobacco industry, working first for Liggett & Myers and later founding the Flowers Brothers Leaf Tobacco Company. This large, two-story Colonial Revival-style building has wood siding and a slate roof. The main house has a fanlight and leaded glass sidelights under its arched entrance porch, which has an exuberant Adam or Federal style, including fluted columns, an entablature with modillions and dentils, and an architrave with triglyphs and metopes. The level of detail put into the classical elements of the porch, along with the artful balance of the home’s exterior elements (door, windows, downspouts) that carefully mask the fact that it is not quite symmetrical, demonstrate the mastery of the architect, which may have been Arthur Cleveland Nash. Many grouped, nine-over-one windows light the house, and arched windows sit in each of the dormers to give light to the attic. To the rear of the house, a 1940s garage has been recently repaired and a charming playhouse still stands - originally built by the Flowers family for their little girl Mary in the 1930s. To the right of the entry, the dining room retains its original painted wallpaper with a chinoiserie bird scene. Before leaving the dining room, take a moment to examine the housing for the radiator built into the wall. These fixtures still supply heat to the house. Beyond the dining room is the kitchen, which includes the cabinets which originally were part of the butler’s pantry and breakfast nook. The kitchen was last remodeled immediately after the movie production wrapped, using the rental fees; another remodel is coming this summer. While you are in the kitchen note the landing for the narrow service stair. It joins the main stairway at its turning so that the servants’ use of the main stair would be invisible to family and guests on the first floor. The original servants’ bath and the laundry have now been converted into a guests’ bath and powder room. Upstairs, there are four spacious bedrooms and three baths. The two original bathrooms divide the pairs of bedrooms. Each of these contains much of its original 1920s tilework and fixtures – note the rounded end of the corner tub. The third bathroom is located in what was traditionally referred to as a sewing room or trunk room. Behind the bedroom on the northwest corner of the house is an original sleeping porch. A similar porch was added on the northeast corner when the kitchen below was updated and enlarged in the 1980s. The narrow stair ascending from the second floor hallway leads to the attic which once contained quarters for one or more servants. There is a lovely, tiny clawfoot tub tucked into one of the front dormers. Over the years, sensitive updates have been made throughout, but the house remains remarkably intact and definitely well-loved. Kitty Moses and Ken Soo’s Spanish Colonial Revival home at 1523 Hermitage Court sits in the middle of a wonderfully designed yard and garden. This is due to careful choices and expert planning that have transformed this half acre property into one of Forest Hill’s most interesting and beautiful landscapes. Kitty Moses and Ken Soo’s Spanish Colonial Revival home at 1523 Hermitage Court sits in the middle of a wonderfully designed yard and garden. 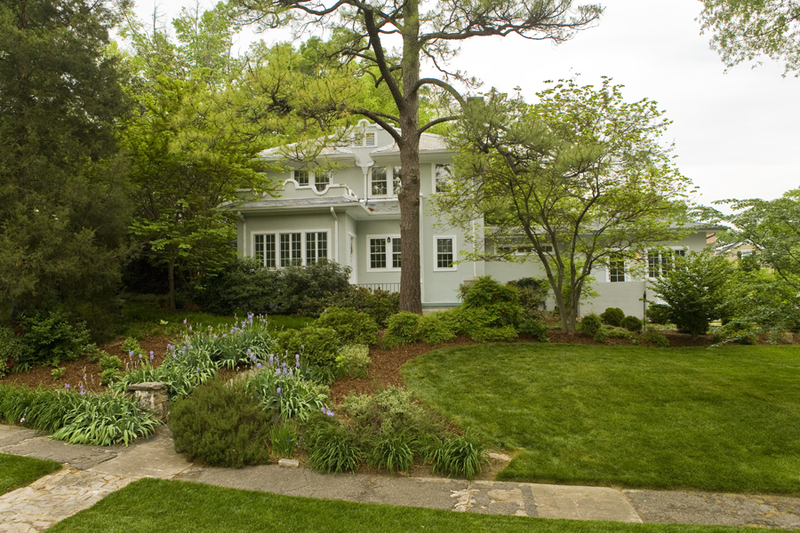 This is due to careful choices and expert planning that have transformed this half acre property into one of Forest Hills' most interesting and beautiful landscapes. 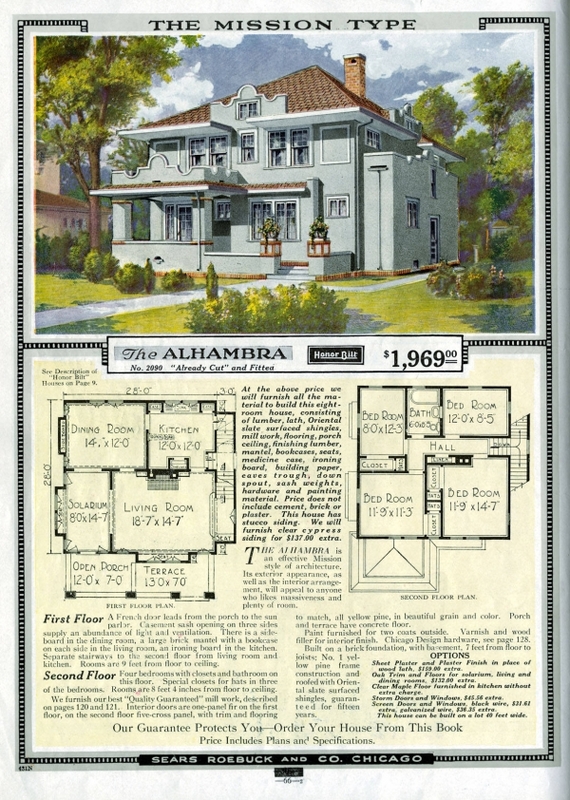 The house – built in 1930 – is a Sears “Alhambra”, nationally one the most popular Sears kit homes. The Alhambra was designed on a basic Foursquare layout with Mission-style detail like curved parapets, stuccoed exterior, and iron railings. Because the house was built in 1930, it is not surprising that there are a few respectful giants casting shade over this address. A Southern magnolia, eastern red cedar, and post oak serve as anchors just as they were imagined to do 80 or so years ago when they were planted. However, the real delights on this home’s outside tour come in more recent and medium sizes. Twelve years ago, Kitty and Ken enlisted landscape designer Sally Pagilai in reimagining their property after their major renovation project flattened and churned up a shady side yard. After adding several smart plant choices to this area just off the “porchlet,” the next phase of their garden planning began. An old driveway extension and carport/pergola was scrapped. In its place came a beautiful stone patio and mudstone walk to carry visitors around the front of the house. In between the stones are well-suited and low maintenance groundcovers such as: ajuga, moneywort, and dwarf mondo grass. Sally helped create the perfect divide between the house and the public sidewalk without forgetting or overplaying the lawn. A modest and gorgeous greensward of turf sets off the “bird garden” which buffers the front and east sides of the house with a smart combination of service berries, abelias, arborvitaes, cherry laurels, and several ‘Tardiva’ hydrangeas. In working with Sally, Ken humbly asked for a single fig tree and room for blueberry bushes. But rather than banish them to an edibles-only bed, he decided to plant them out front the way most folks would a boxwood or an azalea. Because these homeowners and their designer obviously know how to combine plants, the edible and ornamental juxtapositions work perfectly. Now they have several figs, a persimmon, and even a small mulberry tree working together as secret partners in an otherwise ornamental show. The mixtures of perennials, vines, and understory trees make this landscape a worthy inclusion on the Forest Hills Home tour. A ‘Forest Pansy’ redbud draws visitors around back in the early spring while a bottlebrush buckeye makes drivers slow down and ask “what is that” every June when large candlestick panicles of white flowers explode along the western property line. If you talk to Kitty and Ken, you can tell that a lot has changed to this yard in the dozen or so years since it began its transformation. But it is easy to see why they are so proud of the resulting landscape. Like any successful garden, it is a place that draws you outside in any month of the year and for a whole host of reasons. Situated on a slight hill on a large parcel of land overlooking Forest Hills Park, the welcoming Coppridge-Hobart House exemplifies the restful graciousness of the city estate. Built in 1925 for Dr. and Mrs. William Maurice Coppridge, the Tudor Revival home has been lovingly cared for throughout its 87 years. The home has had only three owners, all of whom have been physicians. William Coppridge was born in Virginia in 1893 and educated at the University of North Carolina at Chapel Hill. He earned his M.D. at Jefferson Medical College in Philadelphia in 1918, returning afterwards to Chapel Hill to teach pathology and to begin the organization of a clinical pathology laboratory at Watts Hospital in Durham. He married Ferrie Patterson Choate, a University of North Carolina infirmary nurse, in 1919. Early in their married life, they lived on Ward K in Watts Hospital, where Mrs. Coppridge was operating room supervisor. They are listed in city directories at various other addresses in Durham before settling into their new home in Forest Hills in 1925. 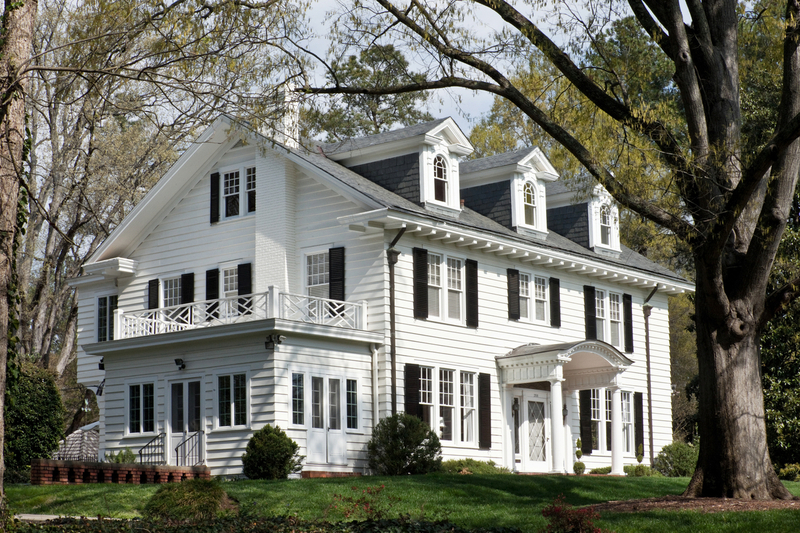 The architect of the home may have been Arthur C. Nash, who moved from New York City to Chapel Hill in 1922 to serve as campus architect overseeing the expansion of the University of North Carolina at Chapel Hill. He and engineer Thomas C. Atwood formed the firm Atwood & Nash, which had an office in Durham in the Loan & Trust Building at 212 West Main Street downtown. Working at both UNC and at Watts Hospital (where Atwood & Nash had been hired to design the Valinda Beale Watts Pavilion, completed in 1926), Coppridge would have known the architect well, and it seems likely that Atwood & Nash would have been his architectural firm of choice. Another clue is a set of 1948 plans for an addition to the home which carries the title-block Atwood & Weeks. This is the firm that succeeded Atwood & Nash after Nash’s retirement in 1930. For well over a decade the white house on the hill was the only one on this section of West Forest Hills Boulevard. Until 1929, the park in front of the home was part of a golf course. The Coppridges raised two sons in the home, James and Alton, and the family had two servants – a man and a woman – who lived in a building (now gone) behind the house. The man served as the gardener and chauffeur, and the woman was the maid and cook. Alton Coppridge’s best friend was the boy growing up in the large thirteen-acre estate “Pinecrest,” across the street. One of architect George Watts Carr’s early commissions, “Pinecrest” is a Tudor Revival home built in 1927. The visitor approaches the Coppridge-Hobart house along a beautiful brick walkway that leads to the entrance terrace where iron rails on either side of the door welcome visitors like open arms. The copper awning over the door and the similar awning over the bay window are two of the home’s most distinguishing features. Tudor details on the exterior include the brick wall cladding, the half-timbered gable over the bay window, the diamond pane casement windows in the dormer above the entrance gable, and the dominant front-facing gable with overlapping small entrance gable. Tall, narrow windows – like those in the main gable – are also a hallmark feature of the Tudor style. One enters the home under an arched transom into an attractive front hall. Through an opening on the right is a large living room with a fireplace. A bay window was a later addition by the original owner, though it appears that it has always been in place. Notice the symmetry in the original plan, with matching doors on either side of the fireplace leading to the porch, matching door openings on the opposite wall leading into the front hall and dining room, and an identical pair of windows along the back wall. Off of the living room is a lovely, large screen porch with arched bays. In the dining room is another Tudor-inspired diamond-paned bay window, also a later addition by the original owner, Mrs. Coppridge. The pair of scalloped corner cabinets were also added by Mrs. Coppridge. A story is told that the installer unknowingly placed the cabinets upside down until Mrs. Coppridge set him straight! From the dining room, one enters into what was the original butler’s pantry, which once contained a breakfast nook. The attractive newly-renovated kitchen and added breakfast room are part of a just-completed project taken on by the current owners, who hired architect Sasha Berghausen of Blok Architecture to redesign an underused, unconditioned space with cracked-tile flooring which had been a later addition to the house. Berghausen reconfigured the kitchen, added the tastefully executed breakfast room, and took over much of the unconditioned space to create a guest bedroom. With what remained, he created a mud room where the visitor can see the original tile flooring. The other downstairs rooms – those on the front east side of the house – were originally much as the visitor sees them now. The room off the entrance hall was originally a den, with a sofa and many bookshelves. The larger room was Dr. Coppridge’s office and personal bathroom. The Coppridges later removed the wall between these two rooms to make one large family room. The current owners have had the original wall re-erected and will use the back room as a family room and the room off the entrance hall as an office. Upstairs, one finds three spacious bedrooms, two baths, and much storage and closet space. After William Coppridge died in 1959, the family sold the house to a Watts Hospital colleague, Dr. Seth Hobart, Jr., and his wife Mary, who lived in the home for over forty years. The current owners, who purchased the home from Mrs. Hobart in 2004, have gone to great lengths to respect the historical integrity of the home, making minor changes reflective of this respect. The home remains a peaceful yet happy haven within the Bull City. From the front, 15 Oak Drive looks like a typical early-20th century Colonial Revival style house. But a surprise awaits in the back garden, which is full of sculpture by homeowner Guy Solie. 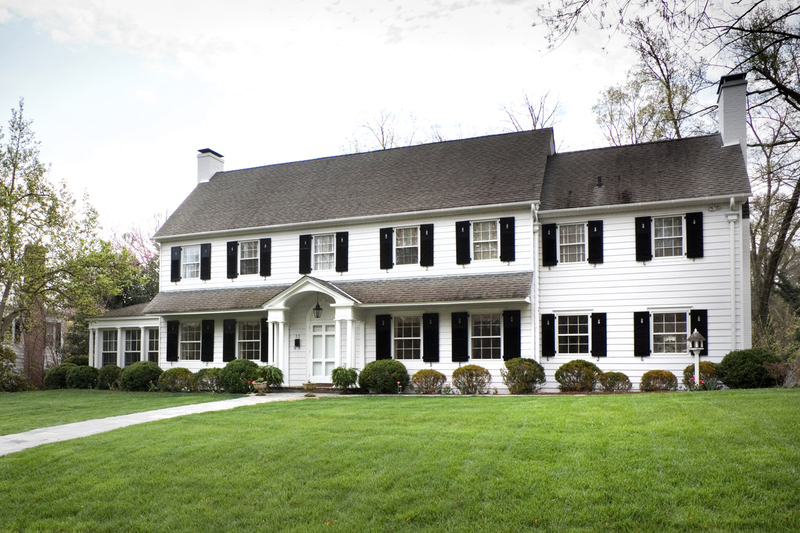 From the front, 15 Oak Drive looks like a typical early-20th century Colonial Revival style house. But a surprise awaits in the back garden, which is full of sculpture by homeowner Guy Solie. Inspired by Alexander Calder, Solie has made sculpture for the past forty years, but he only began making large pieces intended for outdoor installation in 2010. Four colorful pieces arranged on several terrace levels revolve and swing in the breeze, adding extra color and movement to the landscape. The house, which is not open for the tour, was designed by George Watts Carr in 1925 for his own family. A classic Colonial Revival, the house features a small gabled porch with an arched opening at the center of the main block. The narrow shed roofs that flank the entrance are repeated in the main roof above. A two-story wing extends the house to the west and a screened porch is on the east side. The driveway on the west side of the house leads to the sculpture garden behind the house. The large yard falls away from the back of the house in several terraces, and the sculptures are spaced throughout the area. “Full Moon,” closest to the house, features on one side a large white circle balanced by a series of bright yellow organic shapes. This piece is balanced on top of a length of black-painted two-by-four. As the yellow weights rotate, they cast shadows on each other, creating more interesting shapes. “Smiles” features irregular shapes with open centers, painted bright red, yellow, and green balanced on top of a length of bamboo painted bright green. “Waterfall” balances small circles on one side with open-centered circles atop a red bamboo pole. The hanging shapes on this piece are all painted red on one side and green on the other, adding yet another element to the ever-changing composition. “Leaves” reflects the landscape with its leaf-shaped elements balanced atop another bamboo pole. A delicate open circle at the fulcrum point atop the pole and a single round weight accent the graceful organic shapes of the green and yellow steel leaves. Solie has created only two other monumental sculptures. One is located at Club Boulevard Humanities Magnet Elementary School and the other is at the Community Garden on Briggs Avenue. The Thomas A. Stokes House – one of the finest examples of Tudor Revival architecture in Forest Hills - is situated atop a hill overlooking East Forest Hills Drive and the Forest Hills Park. The sizable parcel of land on which the home sits, and the impressive number of mature trees surrounding it, combine to give the home a feeling of a country home. For the current owners, this sense of living in the country within the city is what lends their home its special appeal. 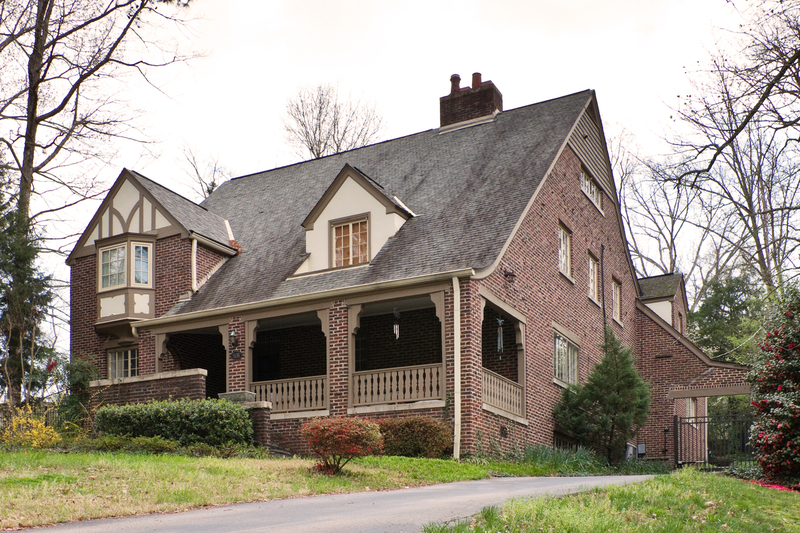 The Thomas A. Stokes House – one of the finest examples of Tudor Revival architecture in Forest Hills – is situated atop a hill overlooking East Forest Hills Drive and the Forest Hills Park. The sizable parcel of land on which the home sits (3 full lots and portions of 2 more), and the impressive number of mature trees surrounding it, combine to give the home a feeling of a country home. For the current owners, this sense of living in the country within the city is what lends their home its special appeal. The development of this section (section C) of Forest Hills began in February 1927 when the New Hope Realty Company surveyed the land and divided it into lots. In that same month, they sold Lots 27 and 28 to Richard H. Wright, Jr, who held them until selling them to Thomas A. Stokes in December 1928. Stokes – a Durham native born in 1897 – worked in the building materials trade and was a partner in the S & S Sales Company on Mangum Street. Stokes would have been closely acquainted with Durham’s prominent builders and architects and, wisely, hired architect G. Murray Nelson to design his home. 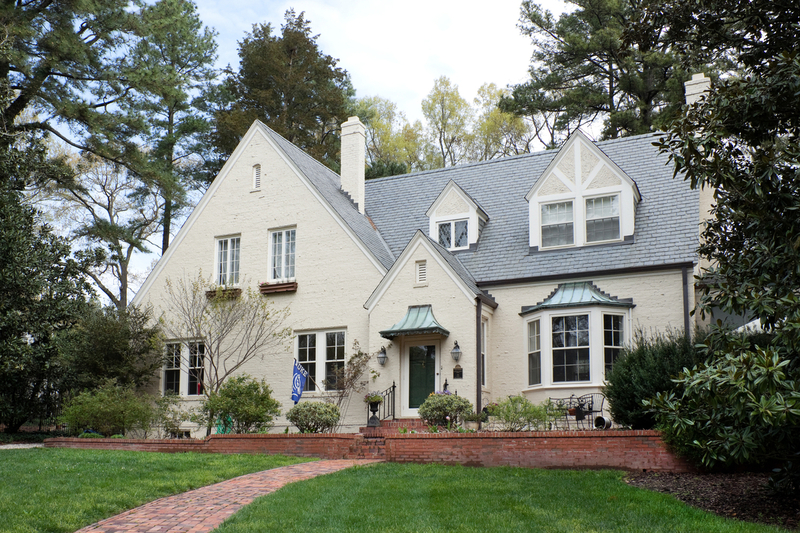 Nelson had already proven himself adept with the Tudor Revival style in designing the magnificent Budd House on South Duke Street in Morehead Hill in 1924. A Canadian by birth, Nelson had been living and working in Raleigh since 1919 (first with James A. Salter and then with Thomas W. Cooper) when he opened his own office in downtown Durham in 1923. After the Stokes House, he went on to design one of Durham’s best examples of Renaissance Revival domestic architecture in the Kronheimer House on Minerva Avenue in Trinity Park, as well as the prominent Tudor Revival Hart House on Duke’s west campus. The dated architectural plans for the house could not be located, so one must assume that Stokes began planning and building his house soon after purchasing the land. The onset of the Depression, however, likely slowed his project considerably, but, by 1932, City Directories indicate that the house at 506 East Forest Hills Boulevard was complete, joining three others nearby (410, 504, and 706). In 1940, Stokes and his wife Sadye acquired portions of adjoining Lots 24, 25 (full lot), and 26. The exterior of the house is one of distinguished solidity. It is a two-and-a-half-story side-gable brick house with a two-story front-gable wing. Its Tudor features include the use of clinker brick, the second story oriel bay window with half-timbered gable above, a gabled dormer with recessed balcony, a 3-bay engaged porch with brick posts and Tudor woodwork, casement windows with heavy wood lintels, and the projecting bay window on the north elevation. After climbing the steep hill and ascending the front steps, visitors are welcomed onto the large, restful porch. It is this space – accentuated by the beautiful screen door – that clearly shows the home’s dual qualities of both elegance and comfort. The interior of the house is gracefully proportioned and inherently balanced. The rooms are spacious and light. Upon entering the central hallway, one finds the dining room on the left and the living room to the right. Ahead and through a doorway one reaches the central stairway leading upstairs. Beyond the dining room is a bright breakfast room/butler’s pantry – a particularly lovely room, due to its useful size and beautiful original cabinetry. The kitchen is also generously sized and has been modified only slightly over the years, with an original pantry having been hidden so as to install additional cabinetry. The current owners have plans to amend the kitchen in the future, and visitors can see an example of cabinetry finishes they have considered. Back to the central hall, visitors can observe the small, mirrored powder room near the back door. Certainly of its time! The south side of the house features the large living room in the front and the cozy den in the back, while the spaciousness of the house becomes even more pronounced upstairs. 2 bedrooms on the north side of the house share a bath. The master bedroom has a large closet (curiously leading into the hall) and a bath, and leads into a room that is now a study but that was originally designed as a nursery. This connects to what were servant’s quarters, with their own outside access. The house also contains a large attic and a basement, wherein visitors can see evidence of the “realm of boys”. Each of the 3 families that have lived in the house over the years have raised two boys in it. Early on, the basement was a locker room with real lockers! Neighborhood boys would come over and put their football pads on before going down to the park to play football. As witnessed by the murals still seen on the walls, the late 1970s saw musicians playing here. It is certainly a unique space in which to consider the past. Thomas A. Stokes was the son of Alvis H. Stokes and Mary G. Angier Stokes. His father was a tobacconist who owned A. H. Stokes & Co. (leaf tobacco dealers) at 114 W. Parrish Street before his early death in 1899 at the age of 55. Thomas was raised by his widowed mother, Mary, who was an Angier and the daughter of one of Durham’s most prominent businessmen and founders, Malbourne A. Angier. He owned a general store at the corner of Mangum and Main for over 40 years. His older daughter, Sarah Pearson Angier, married Benjamin N. Duke, and it is for her that the Sarah P. Duke Gardens were named. After the death of Mr. and Mrs. Stokes, the house was sold to Frederick T. Melges and his wife Connie in 1976. Melges was a prominent psychiatrist, known for his work on the role of distortions of time in psychiatric disorders. 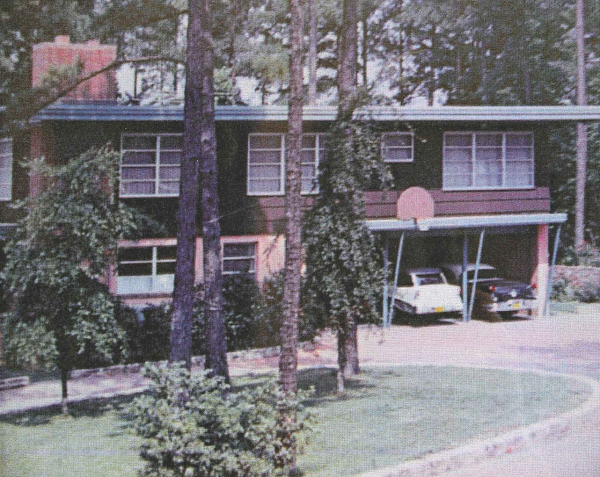 Following passing in 1988, Connie sold the home to Bill and Marcia Lorimer in 1992, who owned the home until recently selling it to its current owners. 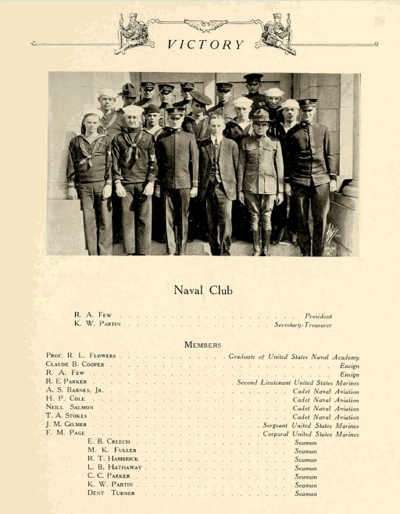 Thomas Stokes was a "Cadet Naval Aviation" member of his high school Naval Club. Allan Gilbert and his wife, Mary, commissioned this quaint Tudor Revival style from George Watts Carr, Sr, because they wanted a similar house to the one they had occupied with their sons Everett and Creighton when they lived in Austria. Gilbert taught English at Duke for many years, was an avid art and antique collector and was considered a true “Renaissance” man. He and his second wife, Beverly, lived in the house until the early 1990s. The current homeowners are the third family to live in the house. The lower elevations of the house are covered with applied half-timbering while the second story of the two-story hip-roofed wing is sheathed in weatherboards. Authentic mortise and tenon construction enframes the large casement windows on the west gable end. A tall, brick chimney with terra cotta chimney pots rises on the front of the house next to the engaged entrance porch. The basement story, which includes a garage under the back of the house, is built of brick. The house's unusual floor plan revolves around a two-story high living room. The ceiling is so high that the outer portions of it slant under the pitched roof. The copper chandelier is original. Original wood paneling lines the walls. Matching paneling is superimposed on the standard interior doors, which almost disappear when they are closed. A huge fireplace of red brick dominates the north wall. Casement windows in the west wall open over a window seat set between original massive bookshelves. On the south side of the house, the living room opens into a large screened porch. Because of the steep slope of the land, the porch is high above ground level and tall trees shelter its view. The dining room and kitchen are small compared to the living room. The current homeowners removed a wall to open up the space and installed natural wood cabinets in the kitchen to match original corner cabinets in the dining room. The door to the pantry was found in the basement and reinstalled complete with its original turquoise paint. Another touch of color is provided by the blue and gold accents in the Arts & Crafts style tile backsplash over the sink and counters. The dining table is original – handmade for the house by Professor Gilbert’s son – and was returned to the homeowners by neighbors who had purchased it at the Gilbert estate sale. A narrow stairway leads from the front entry upstairs to a balcony overlooking the living room through a pointed Gothic arch. Doors with Arts & Crafts style paneling lead to two bedrooms on the landing. The rooms have shallow dormer windows and round coves under the eaves on the outside walls above crown molding. The current homeowners have developed several garden areas around the house, one of which includes a tree house – for adults – built around the trunk of a huge white oak tree. Constructed of wood salvaged from a barn on Cole Mill Road, this lofty retreat features a screened porch, a solar shower, and a small sink. A formal rose garden contains raised beds constructed of stone, as well as fountains and paved paths. At the west side of the property, the ground rises sharply to an Arts & Crafts style garden that one can access with a set of steps constructed from salvaged Durham City curbstones. And, to top it all off, this historic home also features a chicken yard! When Mildred and Dillard Teer decided to leave their traditional home in Trinity Park and build on their Beverly Drive lot, they were not wedded to a style concept, but they knew they wanted an open floor plan with public spaces flowing into one another. They took their ideas to architect and friend, Robert Winston Carr. Carr, no stranger to the colonial and other revival styles that were the bread and butter of the firm founded by his father, George Watts Carr, determined that this project demanded something other than a traditional style house. Instead, Carr chose a modernist design that is now called the American International or Contemporary Style. Its emphasis on long horizontals and irregular massing allowed him to fully exploit the dramatic, steeply sloping site. The International Style is marked by flat roofs, asymmetrical organization of details, cantilevered projections, metal casement windows flush with outer wall surfaces and the absence of formal entryways. Exterior walls are usually white stucco without copings or decoration. 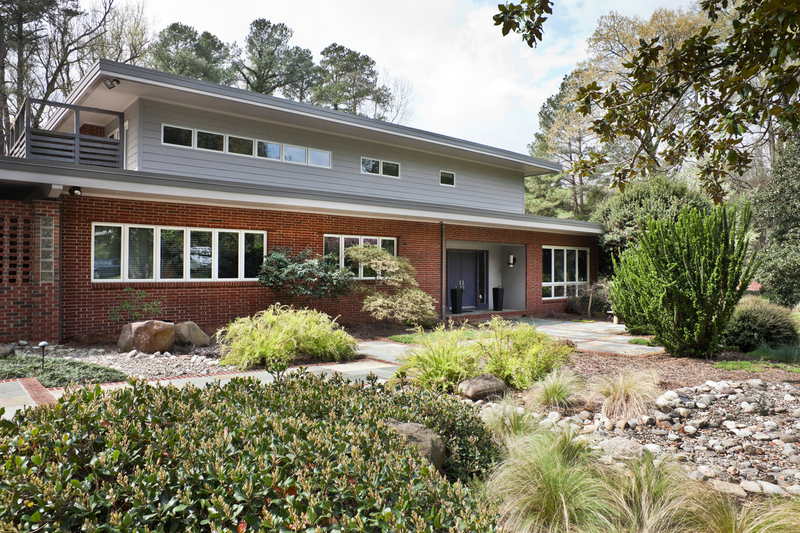 As it evolved in American residential design, the style kept its asymmetry and flat roofs but replaced the austere white stucco with a softer, richer mixture of brick, different woods, and other materials. A tour of the Teer House must begin with a walk around the exterior of the house, following the sweep of the horseshoe bend of Beverly Drive. Beginning at the lower – or eastern – end of the property the guest sees the house emerge from the slope of the hill in a series of horizontal terraces. Each level is emphasized by the broad, metal cornice at the roof line. Unlike the International Style houses of the pre-war period, the Teer house has deep over hanging eaves. Instead of plain stuccoed walls, the house is clad with materials that provide contrast in color and texture. The upper floor is clad with dark, wide cedar shingles, and the floor below that is covered with lighter-colored vertical board-and-batten siding. The whole is supported by a basement terrace of white block that rises up to the house. The door is centrally located in the western façade that is balanced without symmetry. The door, pierced by three square windows of equal proportions, is set in a reeded frame and flanked by narrow sidelights. The entryway is surrounded by a wall of soft orange-pink brick, and the whole is sheltered by a deep, overhanging eave supported by angled-metal pipes. The rich and innovative use of complementary and contrasting materials outside is carried through to the interior. Dillard Teer insisted that there be no plaster or sheetrock inside his house. Standing just inside the front door, the visitor sees vertical wood paneling, brick, bamboo, painted wood, and striated plywood paneling stained with deep turquoise. The ceiling is covered with tiles. From this spot the visitor is invited to each of the three principal levels of the house. Ahead are the large kitchen and dining area. To the right, down a short flight of stairs is a sunlit passage leading to the living room. At the end of this view is another door containing the stacked squares that mark the entry way. As you move from room to room and level to level, note how the wall materials, ceiling heights and window organizations change. In this room, formality is signaled not by a hearth or by time-honored classical elements, but by the drama of high ceilings, rich wood paneling, and a wall-and-a-half of floor-to-ceiling windows. In the den behind the large living room, the walls are faced with sheet paneling covered with a rich, dark, book-match veneer in exotic wood. This is a personal, more contemplative room. The kitchen is nearly all original. Laid out as a generous, live-work space, its surfaces are also wood and man-made laminate materials. The turquoise of the painted stair risers and coping is repeated here and is the only color used to decorate any of the vertical interior surfaces. The current owners have plans to update the kitchen and have taken significant pains to preserve the character of the space. Upstairs are five bedrooms, organized along the two legs of the L-shaped plan. These rooms are spacious and, like the rooms below, display a variety of wood wall coverings that make each room a distinct space. The floors upstairs are cork and carpet. Again, the turquoise paint provides the only color contrast. Some of these rooms have a fine view of the original kidney-shaped swimming pool located in the natural fold of the earth at this end of the site. The Teers had hardly moved into their new home before they expanded it in 1955 by adding a sixth bedroom over the den below. Mildred and Dillard Teer were both children of prominent Durham families. The Teers excelled in road building and other major construction projects. Dillard began working for the firm in 1938 and became an officer when his father, Nello Teer, Sr., retired. Before her marriage to Dillard in 1942, Mildred was a Roycroft. Her father ran one of the largest of the tobacco market warehouses that once lined the streets just north of downtown. 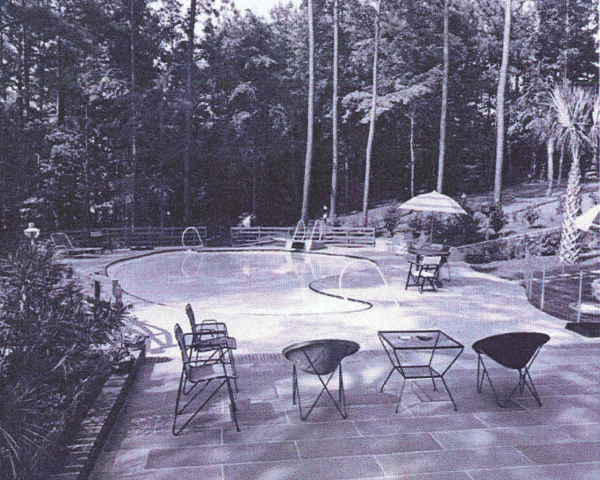 Mildred and Dillard Teer were just in their thirties when they built the house at 40 Beverly Drive. It remained their home for 50 years. 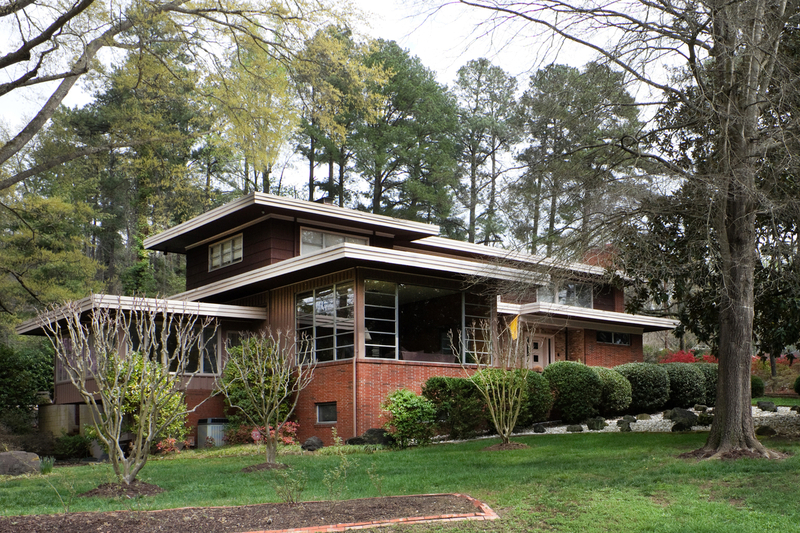 Today – even after 60 years – the house the Teers and Robert W. Carr created ranks as Durham’s most important modernist dwelling and is among the city’s small portion of genuinely important historic buildings. Is there a date yet for a 2013 tour? Thanks.